A new story collection, the first in six years, from one of our greatest living writers, MacArthur "genius grant" recipient and New Yorker contributor George Saunders. The title story is an exquisite, moving account of the intersection, at a frozen lake in the woods, of a young misfit and a middle-aged cancer patient who goes there to commit suicide, only to end up saving the boy's life. "Home" is the often funny, often poignant account of a soldier returning from the war. "Victory Lap" is a taut, inventive story about the attempted abduction of a teenage girl. 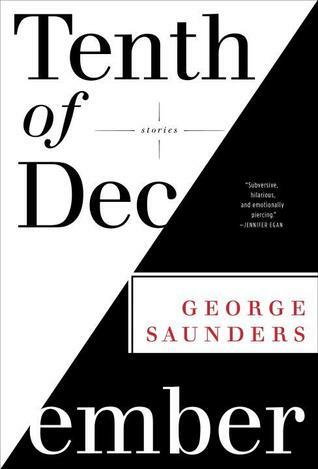 In all, Tenth of December is George Saunders at his absolute best, a collection of stories and characters that add up to something deep, irreducible, and uniquely American. There was a lot of hype when this book first came out a couple of years ago, and I remember really wanting to read it, and then for no particular reason it fell off my radar until recently, when I decided I needed a nice break from all the novels I'd been reading. Man oh man, this collection! Absolutely fabulous! While there were a couple of stories I slogged through as they just didn't interest me too much, as a whole, I love this collection. Saunders has an interesting way of writing that really puts you in the heads of his characters and makes you question what's really going on. I'd definitely recommend this book to anyone and everyone. I can't wait to get my hands on more of Saunders' work.